PRS's Guitar of the Month program highlights the finest and most opulent instruments to come out of its Private Stock, and July's guitar is no different - feast your eyes on the Grainger 5 Fretless Bass. 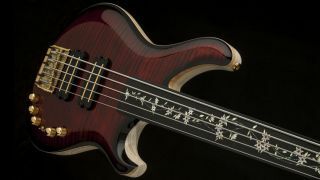 Most notably, the bass features tree-of-life inlays consisting of (deep breath) green heart abalone, sparkle mother of pearl and dark red coral, plus solid white and gold mother of pearl on the fingerboard, headstock veneer, and truss rod cover. That's one helluva tree. Elsewhere, a curly maple top on white wash swamp ash body is finished in a Fire Red Smoked Burst nitro lacquer, while the curly maple neck is paired with a fretless ebony fingerboard and 34" scale length. Grainger Treble and Bass pickups with PRS/Grainger active electronics provide a wealth of tones to boot. The Grainger bass is a signature model for Gary Grainger (of John Scofield, Dennis Chambers and Frank Gambali fame), and this particular version is inspired by a Grainger 5 bass made for longtime Michael Jackson low-ender Alex Al. Bassists with expensive tastes should prep their wallets (and overdrafts): only six of these basses will be made, and although the price is yet to be confirmed, we're expecting something in the region of $7,000-$10,000.